Explanation: A leading candidate for the most mysterious star found in recent times is variable star V838 Monocerotis. At a distance of about 8,000 light-years, V838 Mon was discovered to be in outburst in January of this year. Initially thought to be a familiar type of classical nova, astronomers quickly realized that instead, V838 Mon may be a totally new addition to the astronomical zoo. Observations indicate that the erupting star transformed itself over a period of months from a small under-luminous star a little hotter than the Sun, to a highly-luminous, cool supergiant star undergoing rapid and complex brightness changes. The transformation defies the conventional understanding of stellar life cycles. A most notable feature of V838 Mon is the "expanding" nebula which now appears to surround it. 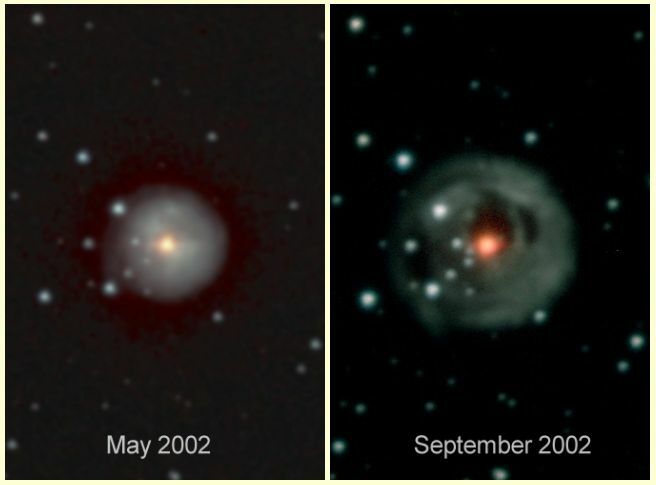 Seen above in two separate images from the South African Astronomical Observatory's 1 meter telescope, the nebula is probably a light echo from shells of formerly unseen material lost by the star during its previous evolution. Light-years in diameter, the shells progressively reflect the light from V838 Mon's outbursts, providing an opportunity to look back at the history of this remarkable star's behaviour.